Quite a while back, when I decided to abandon the best seller list and read what I like and only that, I first read David Weber’s Honor Harrington series. Back then, I had a membership in a “Science Fiction” book club, because the internet, as a commercial arena, was in its infancy, so I learned of new titles and authors via the club “magazine” which was, of course, a monthly sales brochure. I began with In Enemy Hands and, quite frankly, I didn’t like the book all that much. The author seemed to spend many more pages focusing on characters and events which were not about the intriguing protagonist, Honor Harrington, and there were so many concepts that I didn’t understand, such as why she had a “treecat” perched on her shoulder, and why everyone was so horrified when the bad guys tried to kill it. Clearly, there was more back story than I was understanding, so I used my dial-up connection and learned that I’d entered a series that was already several books long. I slogged through the book, thinking that I’d have to figure this out, and later I did order On Basilisk Station from Amazon, and met a younger Captain Harrington, as she takes her first starship command, into a backwater area with a bit of backstory, political intrigue, and lots to admire in the main character. But, that book didn’t make me stay up half the night, either. BTW, when I book robs me of sleep, I know its really good. Still, this Harrington lady was undoubtedly worthy of more of my time, so I moved on to The Honor of the Queen. That one was a homerun, out of the park. When Honor loses her mentor and risks everything to save the beautiful yet backward plant of Grayson, I could hardly turn the pages fast enough. Often, sophomore entries in series are weak, but not in this series. Weber’s heroine moves through space, time, and political intrigue in the next entries, The Short, Victorious War and Field of Dishonor, a weak book if read outside of the series, but important in the complete story line, then The Flag in Exile, which is my second favorite of the series, perhaps because Honor saves Grayson again. Or maybe its the scene where she cuts an enemy “from the nave to the chaps” with a later day version of a samarai sword, in front of the ruling body of the entire planet. Then, Honor revisits both friends and enemies from the debut novel in Honor Among Enemies, which also has a strong story line. Only after these six rather lengthy novels is the stage set for the rather dark entry, In Enemy Hands, which was my introduction to Honor Harrington. When I read it again, after reading the first six books, I liked it better, but it is still a dark chapter in Harrington’s long life. Recently, I picked up the second book, The Honor of the Queen, as a Kindle Freebie from Amazon, and I was hooked all over again. In the past couple of weeks, I re-read it, plus books 3, 4, 5, and 6 in the series. Since I know how it all comes out, well, up until book 11 or so, when I quit reading the series, my zeal for Honor’s exploits is fading a bit. 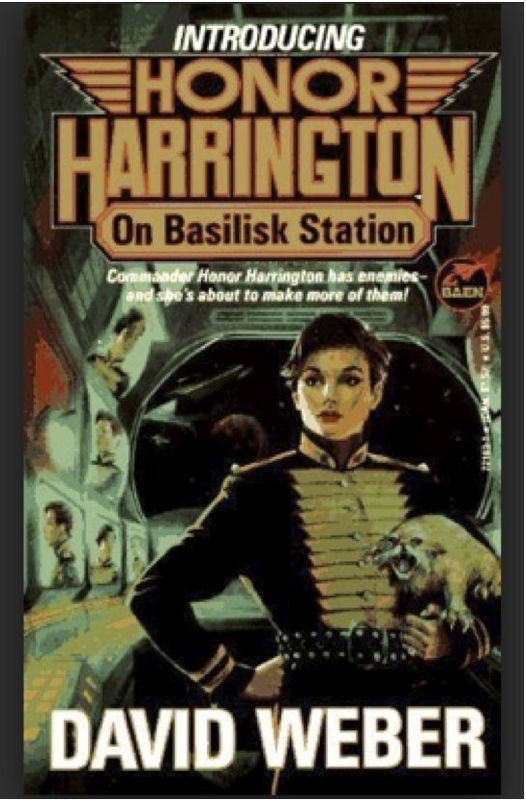 However, anyone who likes military science fiction, or merely a strong heroine, would probably enjoy Books 2-6 of Weber’s Honor Harrington series. As the series has grown longer, it has attracted more and more fans, so there are a number of reviews and sites where readers can learn more, such as the Honorverse Wiki. Honestly, there are few authors who have Weber’s talent, and almost none who have it plus his level of productivity, for in addition to the Honor Harrington series, he has other series, along with some great stand alone novels such as Apocalypse Troll and In Fury Born.